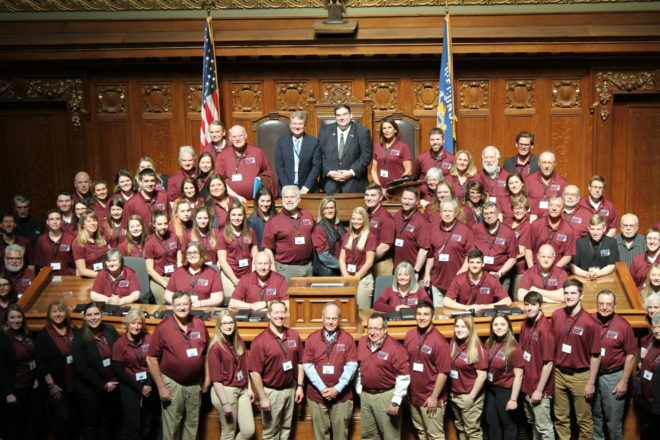 Nearly 100 delegates from Door and Kewaunee counties traveled to Madison last week to talk to lawmakers about the most pressing issues facing northeast Wisconsin. The event is held every two years around state-budget season. In the past, the delegates attending the Door/Kewaunee Legislative Days had some big requests: The group lobbied successfully to overhaul the NR 151 rules regarding agriculture practices in the region, earned $4 million to rebuild the seawall in Kewaunee and supported the construction of Highway 57 between Green Bay and Sturgeon Bay. The bulk of April 3 was dedicated to groups of three or four delegates visiting state representatives and senators to lobby for six items. This is how lawmakers and state agencies responded to requests. Although there is no formal provision proposed in a bill or in the budget to change the school start date, this perpetual battle between the tourism industry and school districts elsewhere in the state drove the topic’s inclusion on the legislative agenda. Every few years, a proposal arises to give local school districts the option to start their classes earlier than the current limit of Sept. 1, but an earlier school start date would cut away at some of the most vital weeks of Door County’s tourism industry. School administrators support the change, claiming additional school days before standardized tests in the spring will improve test scores. Moneypenny said there is no evidence of this, and test scores in Wisconsin have been steadily improving despite the current school start date. Lawmakers seemed receptive to the concern but were generally preoccupied with proposals that are actively moving forward. However, in 2017, a bill found its way into the session calling for the repeal of the Sept. 1 school start date. With Governor Tony Evers’ background as the secretary of the Department of Public Instruction, some believe he will be more receptive to the concerns of schools than to those of the tourism industry. Lawmakers were receptive to the calls for expansion of the rural broadband program, with many echoing their own constituents across the state who are demanding similar support. According to the Federal Communications Commission, 43.1 percent of Wisconsin’s rural residents lack access to at least one broadband service, compared to 30.7 percent nationally. Specifically, delegates sought an increase in funding for the Broadband Expansion Grant Program to $20 million annually. Governor Tony Evers’ proposed budget calls for $78.6 million over the two-year budget cycle – approximately four times the amount allocated to the program in Governor Walker’s last budget in 2017. Despite the broad support for broadband, some lawmakers struggled to sign on to Evers’ significant funding increase. Speaker Robin Vos, who addressed the Door and Kewaunee delegates during breakfast on April 4, responded to some concerns over broadband access. But Vos leaned more toward waiting on advancement in technology than addressing the problem through additional funding in the short term. Kewaunee County Administrator Scott Feldt is all too familiar with the price tag for broadband expansion. The Kewaunee County Board rejected $1 million in funding for broadband expansion in last year’s budget. Feldt said access to broadband is increasingly important for the region’s agricultural sector, with advancements in technology such as driverless combines and robotic milking facilities demanding strong internet connections. Being a budget item, the Joint Finance Committee is the primary gatekeeper in determining what dollar amount will be sent to the governor’s desk for approval. Vos said the Republican-led legislature is working on its own budget separate from Evers’ proposal. The state budget is supposed to be finalized by July 1, but the change in administrations and political gridlock may push that date back. With many of the legislative goals supporting major water-quality initiatives successfully completed – including the new NR 151 rules on manure spreading and the Total Maximum Daily Load study taking place in portions of Kewaunee County – delegates turned to adequate funding of the people and projects that will support those initiatives. In discussions with lawmakers and their staff, Feldt said the Department of Agriculture, Trade and Consumer Protection (DATCP) currently does not provide the amount of funding that the agency itself is telling the county to request. DATCP tells counties how much they should request annually for their land and water-conservation departments. Feldt said that for the past few years, DATCP has only funded about 53 percent of what the agency itself thinks the county needs – a gap he estimates is worth about $100,000. Delegates also sought an increase in bonding from $3.5 million to $5 million for conservation practices on farms such as cover cropping and vegetative buffers. The funds would help farms implement these practices at a time when the agricultural economy continues to suffer, making self-funded conservation unlikely. When it comes to water quality, Vos favors waiting for the Task Force on Water Quality to come out with its recommendations after thorough study instead of including any recommendations in the budget. Dubbed the “Airbnb bill” by many delegates, Rep. Joel Kitchens and Sen. André Jacque have already circulated a memo for co-sponsorship on this issue, which seeks to ensure that payment of room-tax dollars earned through sites such as Airbnb and VRBO reach the proper municipality. A new law passed in the 2017 state budget required vacation-rental websites, or “lodging marketplaces,” to collect and remit room tax on behalf of their users. Airbnb remits this room tax by zip codes, which rarely line up with municipal lines. For example, the 54235 zip code encompasses six municipalities, so the room tax collected by a B&B in Sevastopol may inadvertently be sent to Jacksonport. Lawmakers’ learning curves were steeper with this agenda item because many districts have little, if any, reliance on room tax. Other places where this poses an issue, such as Madison and Appleton, generally have large enough budgets to absorb and ignore this reporting area, but the change is important for Door County municipalities that disproportionately rely on room tax while existing tax-levy limits are in place. Representatives from the Department of Revenue (DOR) cautiously offered assistance in navigating the complex and litigious world of lodging marketplaces. Weber said the companies are often opposed to providing more detailed information to secure the privacy of users. “They have been forced to give detail before, but they don’t like to,” he said. With a co-sponsorship memo actively circulating throughout the Capitol, delegates could more easily direct lawmakers to the action of signing on to the bill. The bill is circulating for co-sponsorship until April 15, when we will know how many lawmakers did sign on. Newly elected Sturgeon Bay Mayor David Ward and City Administrator Josh Van Lieshout were a strong duo seeking a change in state law that would allow the city to create a Premier Resort Area Tax (PRAT), or a 0.5 percent increase in the sales tax on certain goods. The city plans to direct that money toward rebuilding roads. “We’re in a position where much of the infrastructure we need to not only serve our residents but also other people in the county is in dire need of significant investment,” Van Lieshout said. Under the existing funding structure, it would take 55 years to replace all 67 miles of road in the city. Most streets don’t last more than 25 to 30 years. So why is this a problem for the state? Wisconsin restricts which municipalities are allowed to enact a PRAT. Once reserved only for Wisconsin Dells and Lake Delton, eligibility has since been opened to communities including Sister Bay, Rhinelander and Eagle River. Despite an advisory referendum showing that 71 percent of Sturgeon Bay residents would support the PRAT, the city can’t do anything until the state lets it. “We will not have any opposition to it, and we will certainly talk to the governor’s staff,” said David Casey, deputy secretary of DOR. Kitchens said the change will be more likely to move through the state budget instead of a stand-alone bill. It’s unclear how an additional tax targeted at road funding will mesh with Evers’ proposed 4 percent increase in funding for the local road-improvement program. The governor may prefer the increase in state aid instead of an addition to the sales tax. However, the final say on the budget that will go to Evers’ desk rests with the Joint Finance Committee. The proposal to create a $500,000 state grant program to provide grants of up to $40,000 for individuals working to develop the local arts and cultural economy proved the least tenable of the six agenda items. The creative economy is a $9 billion industry in Wisconsin, and it is particularly prominent in Door County. Kitchens has already introduced a bill outlining this program. The bill requires the recipient to show that the funds will support arts education, create jobs, or support products or services that have an origin in artistic, cultural, creative or aesthetic content. Lawmakers who have been around the Capitol for a few sessions said a bill like this floats up every few years, but it has never been successful. Although Kitchens’ bill does have bipartisan support, only 15 representatives and four senators have signed on so far.